. 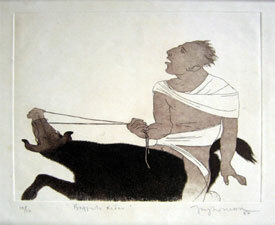 :: Aquatint - Abode of Creativity ::. 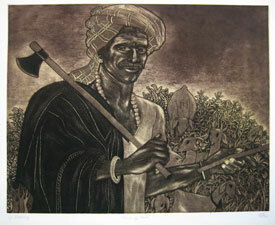 AQUATINT: The plate is sprinkled with a powdered resin, heated so the resin melts and clings, then given an acid bath to bit the areas not covered by the resin, creating a porus ground. 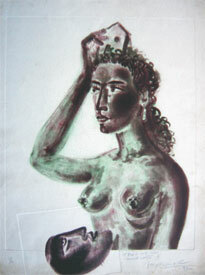 Aquatint is rarely employed by itself, but rather in combination with other intaglio methods.This technique is used to create tone and texture in a print. Each of the different value areas on a plate is etched at different length of time. The deeper the etch, the more ink will gather in the etched texture and the more solidly the area will print. 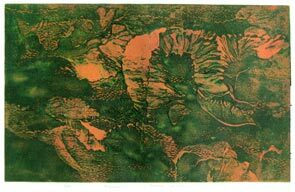 To learn to look at the topography of an etching; the metal's subtle clues of process and of the artist's decision-making choices, offers another level to enjoy. What is Artists Proof(A/P) Print? A signed and numbered print bearing the pencil-written initials A/P. Artist proofs are identical to their S/N counterparts, with the exception that there are fewer A/Ps, thus making them more desireable to collectors. Sometimes the artist may retain the artist proofs for his reference.